Natural breast enlargement pills are advertised on the Internet, television, and in women's magazines. Some of the ads focus on women's insecurities about their breasts, especially after childbirth, weight loss, and the removal of breast implants. Women in search of an alternative to breast enlargement surgery may be tempted to try these herbal pills, without realizing that there is little-to-no evidence about the safety of breast enhancement pills. Most websites selling natural breast enhancement pills do not list any potential risks. Could Natural Breast Enlargement Pills Work? Natural breast enlargement pills could possibly affect breast size because some of them contain herbs that have known estrogen-like effects on the body. Birth control pills are thought to temporarily increase breast size in the same way—estrogen causes fluid retention in the breasts and may have an effect on breast tissue. There is no evidence that these herbs are safe. Adriane Fugh-Berman, M.D., professor of complementary and alternative medicine at the Georgetown University School of Medicine, said in an article published in Obstetrics and Gynecology, "The use of bust-enhancing products should be discouraged because of lack of evidence for efficacy and long-term safety concerns." If breast enlargement pills do have estrogen-like effects in the body, there are some safety concerns. Estrogen given on its own stimulates the growth of tissue in the uterus and is believed to promote uterine cancer, which is why birth control pills and hormone replacement therapy normally contain progesterone to counter estrogen's effects on the uterus. We don't know if natural breast enhancement pills stimulate the growth of uterine tissue. Ethnobotanist James A. Duke, Ph.D., discusses breast enlargement herbs in his book, The Green Pharmacy (Rodale, 1997). Many of the herbs Duke talks about, such as fenugreek and fennel, have centuries-old folk reputations as breast enlargers. However, there is little discussion of safety, and Duke does not address the safety concerns of taking large quantities of these herbs in pill form. Blessed Thistle: The herb blessed thistle is approved by Germany's Commission E for the treatment of loss of appetite and indigestion. It was used historically by nursing women to increase the flow of milk. Dong Quai: Dong quai is a Chinese herb used primarily to relieve menopausal symptoms like hot flashes, reduce menstrual cramps, and regulate menstrual cycles. Fennel Seed: Fennel has been used for centuries as both food and medicine. It was used traditionally to increase the flow of breast milk in nursing women, enhance libido, and increase menstrual flow. There are no published studies examining the use of fennel seed for breast enhancement in humans. In the 1930s, there was some interest in fennel in the development of synthetic estrogens, due to compounds called dianethole and photoanethole. Fenugreek: Although there is an unsubstantiated claim that women in harems were fed fenugreek seeds to increase their breast size, no studies confirm fenugreek can result in breast enlargement. Hops: Used in the brewing of beer, hops contain a potent phytoestrogen called 8-prenylnaringenin which has 0.2-20% the potency of estradiol, the main human estrogen. Hops are sedating and are used for anxiety and insomnia. They can cause excess drowsiness, so people who are driving or who otherwise need to stay alert should use it with caution. Hops should not be used by people with depression. Hops can affect the metabolism of prescription drugs in the liver, such as drugs for allergies, fungal infections, cancer, high cholesterol or oral contraceptives. Pueraria mirifica: Also known as Kwao Krua, Pueraria mirifica is a plant found in Thailand and Burma and used by the indigenous hill tribe people. The plant contains compounds called miroestrol and deoxymiroestrol, which have been found to have estrogen-like effects in the body. Saw Palmetto: Saw palmetto (Serenoa repens) is a herb best known to treat urinary symptoms resulting from benign prostate hypertrophy (BPH) in men. It is thought to prevent the binding of the hormone dihydrotestosterone (DHT) to androgen receptors and to block the 5-alpha-reductase enzyme, which converts testosterone to the more potent DHT. Wild Yam: Wild yam has been found to have a variety of plant-derived estrogens, such as diosgenin. It is promoted to treat menopausal symptoms and relieve premenstrual syndrome (PMS). Bovine Ovary Extract: There are no published studies of the safety or effectiveness of bovine ovary extract in humans. Unlike the other herbs discussed here, websites selling the product say that bovine ovary extract stimulates the pituitary gland resulting in an increase in prolactin and growth hormone levels. Supplements haven't been tested for safety and keep in mind that the safety of supplements in pregnant women, nursing mothers, children, and those with medical conditions or who are taking medications has not been established. If you're considering the use of any supplement or other forms of alternative medicine, talk with your primary care provider first. Albert-Puleo M. "Fennel and Anise as Estrogenic Agents". Journal of Ethnopharmacology. 2.4 (1980):337-44. Circosta C et al. 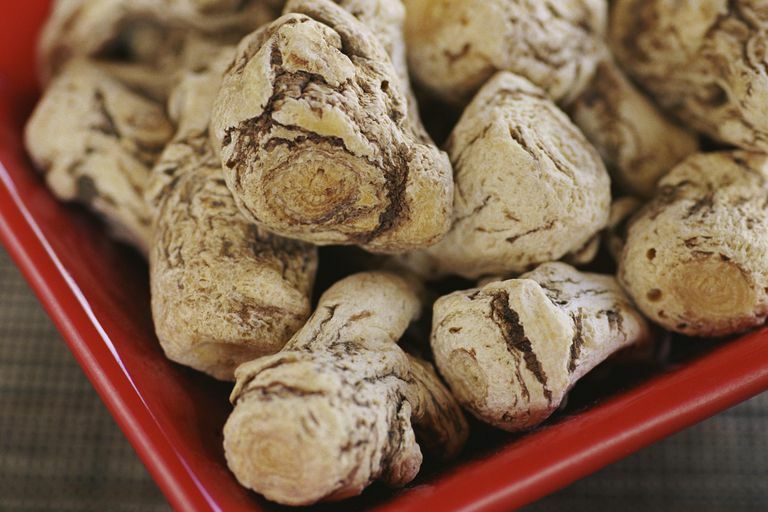 "Estrogenic Activity of Standardized Extract of Angelica Inensis". Phytotherapy Research. 2006 May 12. Fugh-Berman A. "Bust Enhancing Herbal Products". Obstetrics and Gynecology. 101.6 (2003): 1345-9. Goh SY and Loh KC. "Gynaecomastia and the Herbal Tonic Dong Quai". Singapore Medical Journal. 42.3 (2001):115-6. Kassem A et al. "Evaluation of the Potential Antifertility Effect of Fenugreek Seeds in Male and Female Rabbits". Contraception. 73.3 (2006):301-6. Lamlertkittikul S and Chandeying V. "Efficacy and Safety of Puerariamirifica (Kwao Kruea Khao) for the Treatment of Vasomotor Symptoms in Perimenopausal Women: Phase II Study". Journal of The Medical Association of Thailand. 87.1 (2004):33-40. Liu J et al. "Evaluation of Estrogenic Activity of Plant Extracts for the Potential Treatment of Menopausalsymptoms" . Journal of Agricultural and Food Chemistry. 49.5 (2001):2472-9. Liu Z et al. "Correlation Comparison of Uterotrophic Assay and E-SCREEN Assay for Estrogenic Activities." Wei Sheng Yan Jiu. 33.4 (2004):458-60. Trisomboon H et al. "The Estrogenic Effect of Puerariamirifica on Gonadotrophin Levels in Aged Monkeys". Endocrine. 29.1 (2006):129-34. Wu WH et al. "Estrogenic Effect of Yam Ingestion in Healthy Postmenopausal Women". Journal of the American College of Nutrition. 24.4 (2005):235-43. Zava DT, Dollbaum CM, Blen M. Estrogen and Progestin Bioactivity of Foods, Herbs, and Spices. Proc Soc ExpBiol Med. 217 (1998): 369–378.